This is a fantastic opportunity for the business world to step back and reflect. The cracks are starting to show and systems are breaking, some more quietly than others. As so many 21st century leaders know it's time for us to become whole again. We need to pick the pieces and fragments and become whole again as individuals and as organizations. That is one part of the journey that gets disregarded as we are told to pursue growing up. We seem to be in such a rush to conform to what is expected that we lose pieces of ourselves. We get asked from a very young age what we want to do when we grow up; not who we want to simply be. Imagine if you knew you wanted a simple roof over your head and an ability to feed yourself, what would you want to be? or imagine you wanted to be yourself, who would you want to be? What would you want to feel? In the 20th century world of fear, competition and scarcity, we were conditioned to become workaholics, We numbed ourselves with busyness and work ruled our lives and defined who we were. Today, in the 21st century, more people are choosing a different path, one where they start remembering who they are and why they are here. 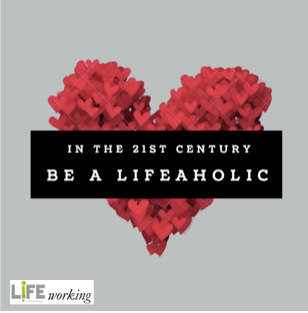 In the 21st century, our choices change and we can choose to be a lifeaholic, where instead of being obsessed with making a living, we start LIFEworking and make a life. I want to co-create a world with you where we stop asking kids what they want to do when they grow up. First of all, growing up is over rated and second of all, why are we pressuring kids about how they should be making a living? Imagine if we asked them how they want to make a life. And this is one of the biggest surprises that people are having from millennials who want to go live on a farm or don't want to own a car or a house. The journey to wholeness as individuals does not shut us out from the world but gathers the world to us. By knowing who we are, we move into wholeness. One of the things that happens as we "grow up" and get conditioned into society by the role we play as an adult is we forget. We forget to play as we become responsible. We forget to make time to spend in nature as that is what vacations are for. We forget that our bodies simply need to move as we condition ourselves to exercise; many of us have to drive somewhere to go for a walk. We forget that we can form our own opinions as we are conditioned by institutions to be normal. And the list goes on. To become whole again, we must remember. It's time to wake up and see that we each have a story. We are all on the same journey. We are meant to be whole. And what's happening today more and more is that we are starting to remember that we each have a voice and our voice counts. Not as a statistic. Not as someone in a demographic group. But when we become whole again, we heal the world. 1. When it comes to our body, does this food that we are consuming have any poisons? Will it kill me? Where does it come from? How was it prepared? Will it fuel me or ultimately make me sick, despite tasting great? Am I making a conscious decision about how I fuel my body? 2. When it comes to my heart, spirit and mind, how am I feeding them? Am I allowing toxic thoughts and people into them or am I honoring them with love, compassion and clear purpose? How am I fueling them? 3.This product or service that I am consuming in my life from this company that calls itself a brand, do I know where they source their products? Is anyone being harmed or do I know the conditions their people work in? What do I know about that company and can I trust their practices? Are the processes they use poisoning our water or harming our planet or people? Am I asking questions or letting other people know about how I feel about the responsibility organizations I do business with to humanity and the world? 4. This organization that I work for or want to work for, will it kill me? Will it burn me out or harm my spirit? Will my whole life be about my work without any time for myself and what's important to me? Will it expect me to work around the clock to make a living or will it respect my needs and allow me to have a life? Will it allow me to be who I am and value and respect my desires to practice my art? Is my purpose tied to the shared purpose of what it creates in the world for me and for the planet? Our institutions, systems and ways of life are fragmented, broken, and endangering our future on the earth. The whole is merely more than the sum of its parts. If business can become whole, we would be putting people in the center. An increasing number of people are reclaiming their voice and more businesses are going to be impacted by customers, employees and communities asking new questions about how business is done. Compassion, empathy and human understanding play a more significant role in the 21st century as whole people demand to be heard and seen. People of all ages no longer segment themselves into their "personal" and "professional" self. We all want to show up in every part of our lives. We want to be LIFEworking instead of pursuing the myth of work-life balance. We are not blending, we are becoming whole again as individuals and organizations by remembering who we are and why we are here.